Monster—a company once known for producing insanely nerdy speaker wire— changed headphones forever (for better or worse) with its fashionable, bass-heavy Beats by Dre line. Now that Monster's cash cow is HTC's cash cow, Monster is clearly on the hunt for new friends. So, if you can't have Dre, why not team up with… Lance Armstrong? Monster's getting into the sporty game with a set of in-ears call the ISport (groan) Livestrongs. According to Monster, the bright-yellow headphones are sweatproof and a patented "in-ear clip anchor system" (which looks a little familiar...) keeps the headphones from slipping out when you're out for a jog. Monster also promises that the headphones sound stupendous with that same deep thudding Beats-by-Dre bass that to help motivate you through your workout. You can get em in February for $180. This time instead of to Dre, a portion of the proceeds will be donated to the Lance Armstrong Foundation. Nostalgic for that "urban," "fashion-forward" approach of Beats? How about some Diesel-branded cans? 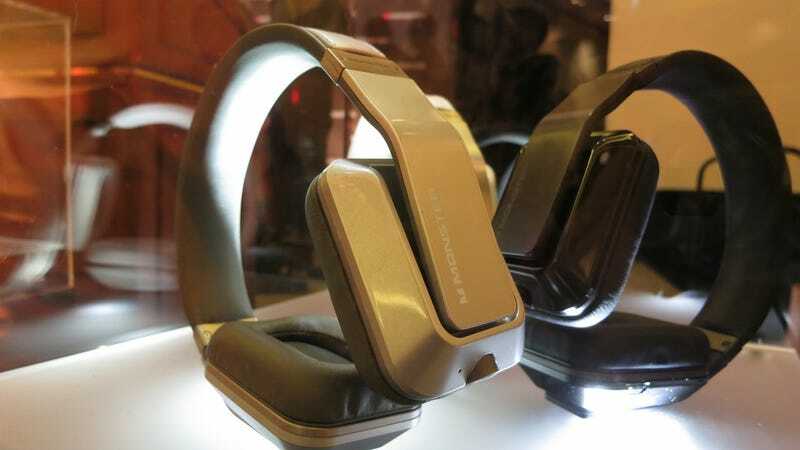 The $250 VEKTR headphones look strikingly different than anything else Monster has ever done. Like rocks on your ears. Whether or not the design is in good taste, well, we'll leave that up to you. And Monster is also throwing its hat into the noise-canceling headphone game, which has treated Bose and others very well over the years. The Inspiration over-ear noise-canceling headphones, complete with magnetic interchangeable headbands for the young and flashy, will be available this Spring for $280. The Inspiration line is fashion headphones to the max—we saw interchangeable headbands that included feathers, spikes, crocodile skin and a lot of other off the wall, straight off the runway-type designs. And if that's not enough new headphones for you, Monster is introducing the Diamond Tears headphones, which are blinged out, mirrored looking cans that Monster made with some Asian superproducer J.Y. Park who's produced music for the biggest pop stars outside of America. I guess he's the Dr. Dre of Asia? Anyway, the Diamond Tears will retail for $280.